Text NEW10 to 21000 for 10% off Your First Visit! What’s Happening at Good Works Auto Repair! For the entire month of April, you will get $25 toward your next auto repair service, when you spend $100 or more! 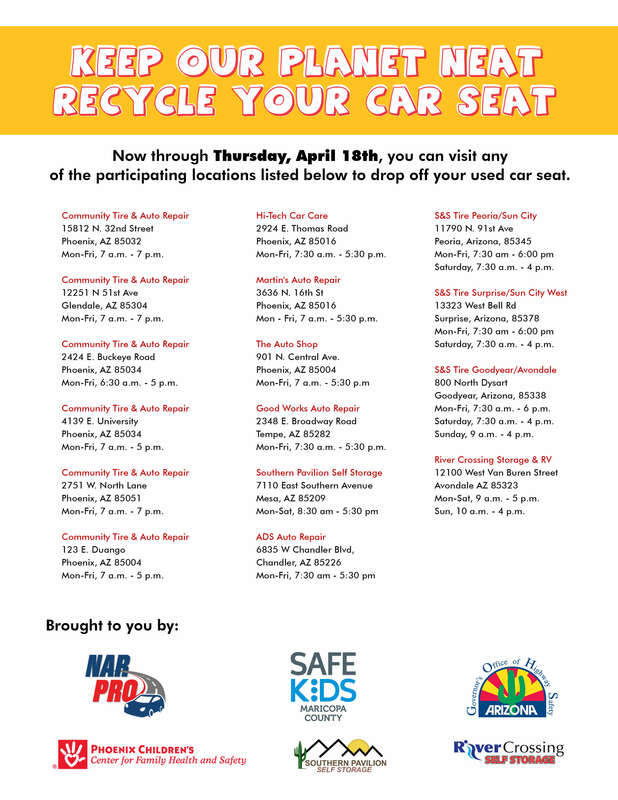 Happening at Good Works Auto Repair, NARPRO is partnering with Safe Kids Maricopa County and other local organizations to collect old, expired, and damaged car seats, which volunteers will take apart for proper recycling. Car seats don’t last forever, and over time their components will break down, especially in the hot Arizona sun. 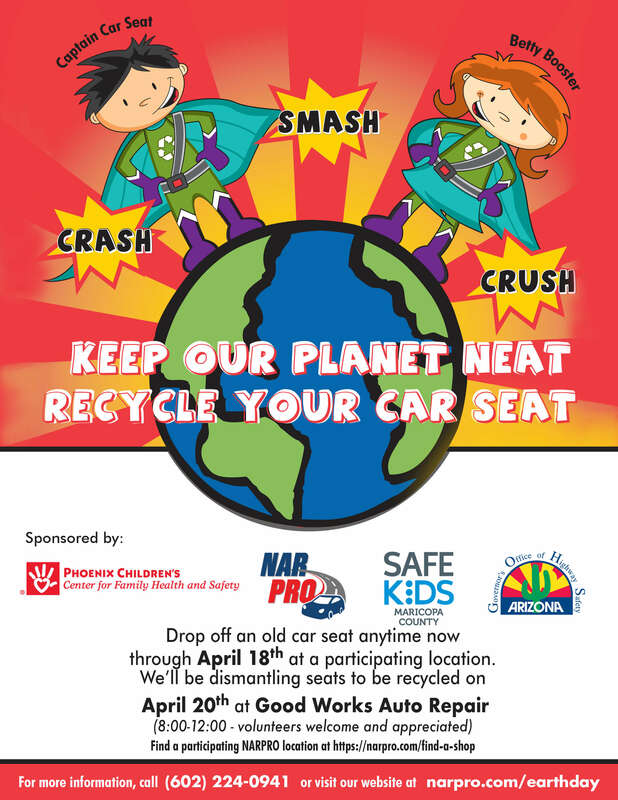 Residents can drop off their car seats that need to be recycled at one of our participating NARPRO shops from now until April 18, 2019. We will be recycling them on April 20th at Good Works Auto Repair located 2348 E Broadway Rd, Tempe, AZ 85282. Did you know, the nation average warranty is just 2 years/ 24k mile warranty? 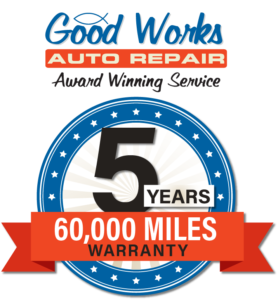 At Good Works, we are so confident in the quality of the parts and the practices we use, that we stand behind our work with a 5 year/ 60,000 mile warranty on parts and labor. This warranty is restricted to certain types of auto repairs. Repairs must be performed with parts determined to be of appropriate quality and must accompany best practices for that repair. “Wear and tear” and maintenance items** are covered by our standard wear warranty that apply to that item. For the first 24 months / 24,000 miles the warranty is nationwide, for the duration of the warranty all repairs MUST be completed at Good Works Auto Repair. Warranties are not transferrable. Good Works will not pay another facility to perform warranty repairs. To keep warranties in effect, some maintenance items may apply. Good Works reserves the right to void any warranty if there is evidence of abuse, modification, neglect, intentional damage or repair of another system has affected the original warranted repair. Good Works will not warranty any parts of the vehicle that was not repaired at Good Works originally, regardless of how damaged. Other exceptions may apply.